Governor Tom Wolf signed an executive order yesterday aimed at combating pay equity in Pennsylvania. 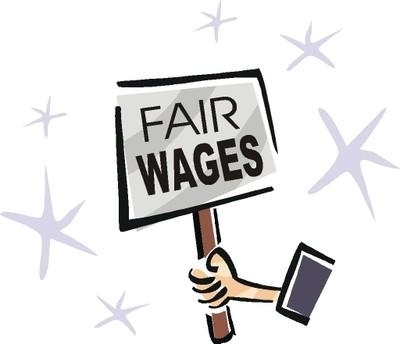 The order, called “Equal Pay for Employees of the Commonwealth,” prohibits employers in state government from asking applicants for their salary history in an effort to steer employers away from reinforcing pay inequities between men and women. Today is April 15, also known as "4-15." In 300 cities in 40 countries today fast food workers are driving home the point that "McJobscost us all." Pennsylvania workers in multiple service industries are now very active in the Fight for $15. For example, nearly 5,00 nursing home workers at 42 nursing facilities in Pennsylvania recently achieved contracts that lift their wages to $15 per hour over time. KRC reports released two days before "4-15" in 2015 and on November 9 made the case for this increase. Just a couple of weeks ago, UPMC in Pittsburgh announced it will increase wages to $15 per hour as noted in this KRC statement and this Pittsburgh Post-Gazette column quoting KRC. Airport workers in Philadelphia, fast-food workers, security guards and janitors have also been active and achieving victories in the Pennsylvania Fight for $15...with organizing efforts building in home care and child care. 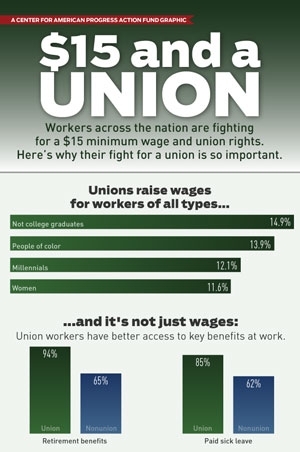 Check out this graphic (also copied below) from the Center for American Progress, which explains how important the "and a union" part of the phrase "Fight for $15 and a union is." You see, $15 per hour in the near term would be a massive gain that drastically expands the number of living-wage jobs. But "and a union" — unions that once again represent at least 35% of the workforce anchored service industries that can't relocate — would make tens of millions of McJobs part of the middle class permanently. Hats off to the Fight for $15 workers in Pennsylvania and across the country for helping to save America from itself and lighting the fire that eliminate the scourge of inequality from our job market, or political system, our communities, and our schools. A new report by the Institute for Women’s Policy Research ranked the 50 states and the District of Columbia based on the status of women in six different categories: poverty and opportunity, work and family, violence and safety, reproductive rights, health and well-being, and political participation. Minnesota, Connecticut, Massachusetts, and Vermont scored highest overall. This week at Third and State, we blogged about a missed opportunity in the House to close corporate tax loopholes, the troubling trend of employers taking on unpaid interns to do work once performed by paid staff, the public health benefits of expanding Medicaid coverage, more on Pennsylvania's job growth ranking, and a Mother's Day look at the number of Pennsylvania moms who benefit from key federal tax credits that may be at risk. On state budget and taxes, Sharon Ward shared her statement on the passage of a House bill enacting hundreds of millions in new corporate tax cuts. The bill represented a missed opportunity to close tax loopholes, Sharon wrote. We also posted our live Twitter coverage of the House floor debate on that bill. On higher education and the economy, Jamar Thrasher blogged about the troubling trend of employers recruiting unpaid interns to perform duties that were once performed by paid staff. On health care, Chris Lilienthal wrote that expanding Medicaid in Pennsylvania will make Pennsylvanians healthier and more financially stable — and even save lives. On jobs and the economy, Stephen Herzenberg delved a little deeper into Pennsylvania's job growth performance in light of recent remarks by the Governor. And with Mother's Day this weekend, Sharon Ward blogged about the hundreds of thousands of working moms in Pennsylvania who rely on the Earned Income and Child Tax Credits to make ends meet. Get the latest budget news at the Pennsylvania Budget and Policy Center's State Budget and Tax Policy Page. Learn more about pension reform in Pennsylvania at the Keystone Research Center's Pensions Issue Page. Learn more about the federal opportunity to expand Medicaid coverage in Pennsylvania. Join the Pennsylvania Budget and Policy Center on Tuesday, May 14 from 4 to 5 p.m. for a webinar on making the Medicaid expansion a reality in Pennsylvania. Learn more and register to participate. Join the Keystone Research Center and Pennsylvania Budget and Policy Center on June 13 for our Annual Awards Dinner at the Hilton Harrisburg. Learn more and purchase tickets. With Mother's Day approaching this weekend, we are highlighting new research showing that 670,000 working moms in Pennsylvania rely on the Earned Income Tax Credit (EITC) and the Child Tax Credit (CTC). Both tax credits also lifted nearly 118,000 Pennsylvania children out of poverty annually between 2009 and 2011. This week at Third and State, we took a closer look at the latest Pennsylvania jobs numbers and blogged about the prevalence of voter suppression proposals across the U.S., the wage gap between men and women college graduates, and highlights from a debate in Bucks County over public pensions. On jobs and the economy, Mark Price wrote that for the first time since the start of the Great Recession, unemployment in Pennsylvania moved above the U.S. jobless rate in September. Mark also blogged about a "tsunami of jobs" in Pennsylvania last month and explained how there are two surveys (one of households and the other of employers) used to track employment trends. On voter suppression, Jamar Thrasher blogged about more than 180 voter suppression laws proposed nationwide between 2011 and 2012. On income inequality, Jamar Thrasher wrote about a study finding that women college graduates are paid only 82% of what men earn a year after graduation. On public pensions, Chris Lilienthal highlighted a recent debate on the issue where Stephen Herzenberg of the Keystone Research Center made the point that teachers and other public-sector workers should not be punished for decisions made in Harrisburg that have led to the current pension funding challenges. The American Association of University Women is out with a study finding that college-educated women are earning only 82% of what men are paid a year after graduation. The report controlled for various factors that affect earnings, such as occupations, majors and hours worked, to ensure the study made a true apples-to-apples comparison. This week at Third and State, we blogged about the State of Working Pennsylvania, the latest U.S. jobs report, the disproportionate number of women affected by public-sector job losses and much more. On the State of Working Pennsylvania, Mark Price blogged that working and middle-class families have seen their incomes decline over the past decade and may end the next decade with less income from work than they started with in 2010. On jobs and the economy, Mark Price blogged that while U.S. unemployment declined in August, the overall report is a disappointment, with more people dropping out of the labor force and growth in payrolls falling below the average for the year. Mark also highlighted what the national experts are saying about today's jobs report. On women and the economy, Chris Lilienthal blogged about a new report finding that women are losing jobs in the economic recovery thanks to state and local cuts, especially to education and social services. On state tax policy, Chris Lilienthal shared a Harrisburg Patriot-News editorial calling for an excise tax on cigars and smokeless tobacco, as a study by the Centers for Disease Control and Prevention finds that an increasing numbers of teens are smoking cigars and using smokeless tobacco. On public welfare issues, Mark Price highlighted an Erie Times-News editorial that criticized a change in payroll systems made by the Department of Public Welfare that has delayed paychecks for workers who provide care to Pennsylvanians with disabilities. Pittsburgh Post-Gazette columnist Brian O'Neill writes about the impact on local schools of a tax deal for Royal Dutch Shell to build a petrochemical plant along the Ohio River in southwestern Pennsylvania. The so-called cracker plant would take the place of a zinc smelting plant that is moving south. The tax deal for Shell will end up costing the Center Valley School District $275,000 in property tax revenue, even as the new facility and related growth are expected to bring in more students.